One thing I've always had trouble with about graffiti, aside from it being vandalism, is the meaning of some of the messages. Does anyone, but the author of this act of vandalism understand the message? 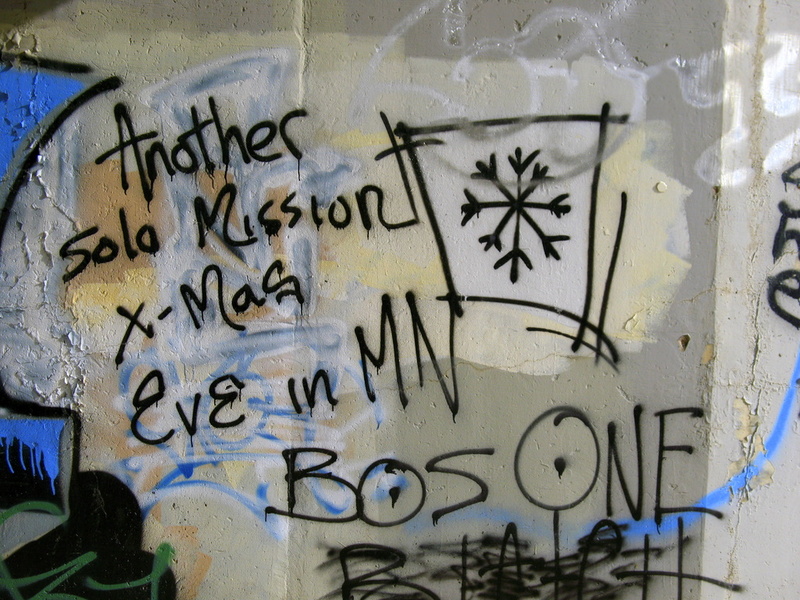 "Another solo mission X-Mas eve in MN" signed "BOS ONE". See, what does it mean? "another solo mission on christmas eve by bos one"
True, but what was the mission? Another solo mission means the artist went out alone that night, rather than with another writer or two. His "mission" was spray painting the wall. X-Mas Eve is, obviously, Christmas Eve, or December 24. His tag is Bos. That is the name he writes in paint all around town. If he posts his work on the internet, he'll call himself Bos, and he'll go by Bos. He is "Bos One," meaning that he is the first and only "Bos". "Bos" is his name, and no one else writes "Bos." He is Bos One. Ahhh, having a bit more understanding, gives me a better appreciation for the work. Don't get me wrong, despite me making fun of it on my blog, I really like most of the work I see. A "mission" usually involves painting a number of walls, but it may have only been that one....Solo obviously means he went alone instead of with other taggers.